I love a good pick me up, but when I was on my way to the event on that evening, I didn't know I was going to be having such a relaxing and welcoming evening! The event was held at their cute store in Norwich, which is opposite Bird Cage! When we walked in we were greeted by an incredible aroma that smelt amazing! We were also greeted by the people that represented Neal's Yard Remedies and they told us about the background of the company. It was so nice to hear about a company that are truly passionate about organic and ethical products, and really do care about where they get ingredients from. Learning that they make their products in beautiful Dorset, I could feel myself warming up to this brand and I was excited for what was in store. Champagne was flowing, and the most stunning treats (freshly made by an organic chef!) were laid out beautifully on the tables. I was in love - I didn't want to leave! I felt really privileged to be there. We had the loveliest champagne which had cute little strawberries in, which made me realize that they really paid attention to all the small details to make the evening something to remember. They then asked us if we wanted to have a massage and reflexology. Having to dance often at university, I jumped at the chance. I was lead up to this beautiful room, and Adam asked me any problem areas and then he got to work. He was amazing! I felt so relaxed and the oils they used were fantastic! I will be coming back again soon - I'm even going to bring my boyfriend a long as he'll love it! I then had a reflexology treatment which is all about the pressure points on the feet. I had heard of it before, but never really ventured into it. Reflexology helps with various things from the digestive system to anxiety. This was just as good as the back massage, and I came downstairs again feeling relaxed, positive and open minded. I also learnt that they did makeup, which I instantly gravitated towards! I was interested in their super soft brushes and mineral foundation. I couldn't believe the amount of amazing products they offered! I learnt so much at this event, and I'm so glad I've been introduced to a new brand which I know I'll love! 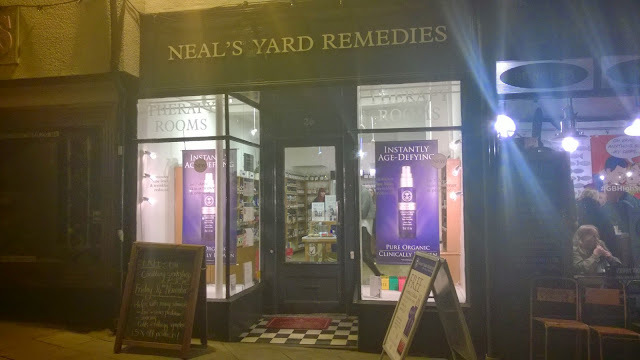 As I left, I was handed a cute little gift to say thank you for attending, which I will be reviewing soon - Along with some other Neal's Yard Remedies goodies I picked up! Sounds awesome! And suuuper relaxing! It really was! Such a lovely evening, and a great brand!